Co-operatives tend to mirror their cultural context. Their democratic nature allows them to escape the homogenising demands of capital and to focus on the different ways value can be delivered to their members and communities. So it was not so surprising that the annual Platform Co-operativism conference in Hong Kong was notable for the many faceted ways that platform co-operatives are developing across the globe. They may have a common gene pool but the way it is expressed is very much a reflection of the community that they serve. A common definition of platform co-operatives is still emerging. Trebor Schultz (the New School) as the primal protagonist of the Platform Co-operativism movement spoke to the very tangible ways that work is being done to build momentum. This includes projects around the Platform Coop Development Kit that are at the vanguard of change to create open-source software by industry sector and by common function. It’s a very utilitarian definition of platform co-operatives. In line with these developments, Danny Spitzberg (CoLab) suggested that perhaps it makes more sense to talk about ‘co-operative platforms’– that they are not a new type of co-operative but a specific way to organise a technology platform. They represent the opportunity for the value of a platform’s network, whatever its size, to be retained by its users rather than passed over to profit-motivated shareholders. This makes intuitive sense, as unicorns can only exist if they are able to capture the lion’s share of the network value they catalyse. For the purposes of this note, we’ll adopt a simple definition that co-operative platforms (aka platform co-operatives) include all those co-operatively owned technologies that enable communities to create online networks. 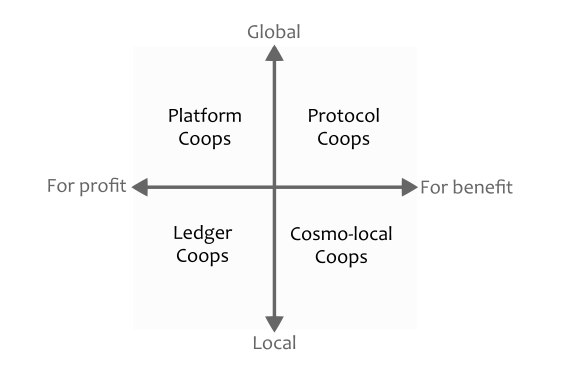 There is a willingness for co-operatives to share platform technologies across borders. One of the benefits of being a global conference is that could draw on the latest thinking and developments from a wide variety of industry participants. And as co-operatives are pretty good at sharing, it offers a way for the sector to foster development across borders. But while platform technologies are generally portable by nature, the way they can be shared will depend on the economics and structure of the networks that they enable. So there were examples at the conference of open-source codebases, hosted software-as-a-service options; peer-to-peer licensing for sharing of code between members; and, proprietary closed software platforms that were owned by cooperatives. Similarly, the reach of the communities that use a technology can define how platforms can achieve scale and therefore the way they might be shared – from platforms that are defined by an industry or function and that can be adapted to meet local needs, to placed-based co-operatives that seek to take advantage of common infrastructure platforms. We can see these factors being played out in the different co-operatives that presented at the conference. This approach is exemplified by the work that the New School is doing with SEWA to create a platform to assist beauty workers in India. Similarly, CoopCycle has created open-source software that enables worker coops to create their own local bike sharing schemes. By solving for a specific problem and making the solution open-source, it is hoped that these platforms can be picked up and developed to meet similar needs in other parts of the world. Open source software has it limitations, particularly as it still requires that each instance is customised and maintained to meet local needs. For this reason, another way of targeting scale efficiencies is by creating hosted solutions that offer more plug’n’play type functionality. For example, Sharetribe – which enables communities to create their own labour or product hire markets – is a co-operatively owned platform that offers hosted, customizable services. And then there are the platforms that offer services that meet the specific needs of communities of interest. Their technology platforms tend to be highly customised to the circumstances and target scale at the nation-state level. For example, a worker co-operative like SMart offers very sophisticated back-end support for skilled freelancers. It needs to be specifically customised to the regulatory framework of the region it operates in. Similarly, NeedsMap – which connects donors with communities in need – maximizes its effectiveness when it can match needs on a country-wide scale. Finally, there are the platforms that are developing capabilities that can support co-operatives regardless of their purpose or structure. These are platforms that are aiming to create common infrastructure. So for example, Coop Exchange is aiming to make it easier for co-operatives to raise funding. Similarly, Geddup is being developed to support distributed organising and governance in co-operatives. Interestingly, Geddup takes a blended approach to sharing the technology as it is being created as an enterprise coop where its members are large organisations that require their own instances, and it also makes a hosted ‘community’ version available to smaller organisations. The sharing of value across different stakeholders remains a challenge for the sector. One of the underlying themes of the conference was the question of how value is shared between founders and investors of a platform on the one hand, and its users on the other. It’s a foundational issue. Notwithstanding their democratic approach to the distribution of value, platform co-operatives still need to find ways of attracting the resources required to foster development. To resolve this challenge, some platforms have sought to align interests by promising to share surplus with founders and investors subject to pre-defined constraints. For example, Fairmondo’s model is to allocate slices of equity to founders and investors, but to also place limits around individual shareholdings, salaries and dividends paid. Notably, Coop Exchange is seeking to free up investment in the sector by promoting a standardised methodology for sharing value based on the Fair Shares model that rewards investors, founders and users. These concerns are not just limited to multi-stakeholder co-operatives. The sharing of value between members based on patronage or other metrics can give rise to wide dispersion of returns. The debate around these issues suggests that this remains a key focus for platform co-operatives to address both at their founding and as they grow. There is plenty of scope for the cooperative sector to work with data. Notwithstanding these examples, there remains an underlying concern about how data is managed by co-operatives and the potential role of emerging technologies in augmenting this. In particular, there was some deep suspicion around blockchain approaches to solving problems. My view is that co-operatives, with their focus on individual agency within a collective structure, are ideally placed to help with the transition to a data-driven economy. The big technology companies are already well advanced in developing algorithmic ways of interacting with the disempowered consumer. Co-operatives that can understand and develop event-driven solutions, while still enabling members to retain control over their data, offer a very healthy alternative approach. The conference was a brilliant hotpot of fresh ideas. In our own corner of the world, it’s already lead to the introduction of a few of these international efforts into the Australian market. We look forward to seeing where the movement has taken us next year.